By Paul Deng in China on January 20, 2014 . According to a study released in December by U.S.-based Battelle Memorial Institute, R&D spending in China will likely reach $284 billion this year, up 22% from 2012. That compares with just 4% growth forecast in the U.S. to $465 billion for the same period. 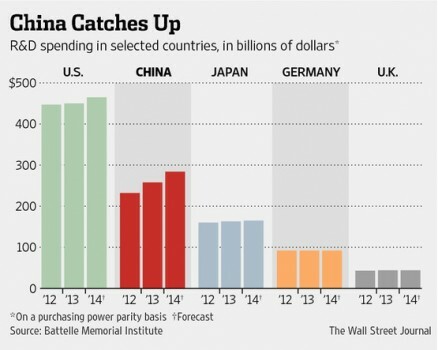 It forecasts China will surpass Europe in terms of R&D spending by 2018 and exceed the U.S. by 2022. According to WSJ, three Chinese companies are likely to emerge as China’s innovation leaders. They are Huawei, Lenovo and Tencent. At Shenzhen-based Huawei Technologies Co., the world’s second-largest telecommunications-equipment supplier by revenue after Sweden’s Ericsson, annual R&D expenditures rose fourteenfold in a decade to $5.46 billion in 2013 from $389 million in 2003. Personal-computer maker Lenovo Group Ltd., which last year overtook Hewlett-Packard Co. as the world’s largest PC maker by units sold, is setting a new precedent with its aggressive global expansion in smartphones. Tencent Holdings Ltd., owns the WeChat smartphone application. Launched in late 2010, WeChat dominates China’s mobile messaging market and the majority of the app’s 272 million monthly active users are in China. But last year, it spent $200 million on overseas ad campaigns to push WeChat into many markets including India, South Africa, Spain and Italy. Tencent says the app has more than 100 million downloads abroad. WeChat was ahead of competitors in offering an easy-to-use feature for sending recorded voice messages and it is challenging the dominance of Silicon Valley’s WhatsApp, which has more than 300 million monthly active users globally. Tencent’s share price nearly doubled last year and its market capitalization of $123 billion isn’t far from Facebook Inc.’s $139 billion market value.